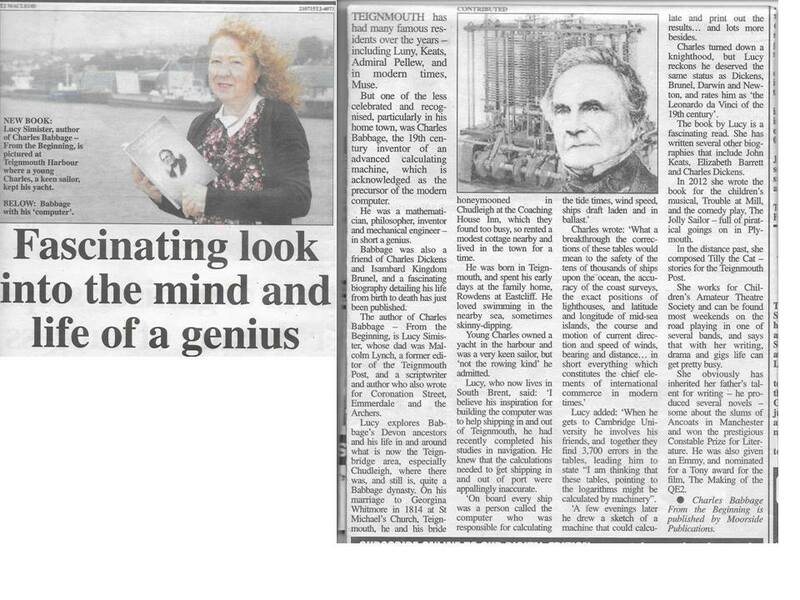 I am very excited to post here the newspaper article published in the Teignmouth Post – and I must say a huge thanks to John Ware… Click the image to read it in its own window. Babbage gets involved with the railways. From Royal Fowey Y.C Dear Lucy On behalf of the Commodore and Members of the Royal Fowey Yacht Club we thank you very much for your fascinating talk about Charles Babbage. I think many of us had not realised just how influential and prolific he was. He knew and influenced so many people. Once again, thank you from all of us. It was a great pleasure to have you with us. Kind regards. On behalf of the Commodore and Members of the Royal Fowey Yacht Club we thank you very much for your fascinating talk about Charles Babbage. I think many of us had not realised just how influential and prolific he was. He knew and influenced so many people. Once again, thank you from all of us. It was a great pleasure to have you with us.